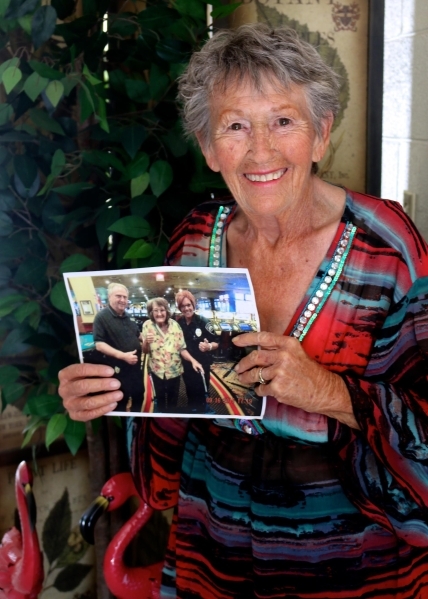 A 72-year old Boulder City woman died on the afternoon of Sept. 5 at the Railroad Pass casino in Henderson. That is, until she was brought back to life. Johnson returned home, and was heading out to the Railroad Pass casino to pick up a free coffee mug, part of a promotion the casino was offering to its players. Johnson remembers leaving her drapes open as she was walking out the door, knowing she would be right back. Johnson drove her car and parked it at 7-Eleven, where she then took the bus for a dollar over to the casino. According to her doctor, Johnson, who’s smoked for 62 years, had suffered from cardiomyopathy, which is when the heart muscle becomes inflamed and enlarged. Her heart was failing, and Johnson went into sudden cardiac death, meaning she was clinically dead on the Railroad Pass floor. Jacqueline Morris and Stuart Weinstein, security officers at the casino, were the first to respond when Johnson collapsed. Using a defibrillator and CPR, the two were able to bring Johnson back to life and stabilize her condition while waiting for the ambulance to arrive. It may have been fate intervening that Morris was there at the exact moment she was needed. She is currently studying to get a Bachelor of Science degree to become a registered nurse. She and Johnson said that a friendship has formed since the incident. They talk on the phone or send each other text messages every day, and are friends on Facebook. Collapsing at Railroad Pass was eerily the best thing that could’ve happened for Johnson, as she said the doctors informed her that if she had been alone at home, she would not have survived. Since the incident, Johnson has had angioplasty — repair or unblocking of a blood vessel or coronary artery — and a pacemaker inserted into her chest. Johnson said she feels great since the procedures. She said her doctor reduced the amount of some prescription medication that she had been taking, and her walking has become more stable.